When William Blake walked out of his Cottage on his very first morning in Felpham, he saw a couple of ploughmen working on a field nearby. One of them was a boy, and he called out in the clear morning air, ‘Father, the gate is open.’ Those were initiatory words for his new life away from London. In the letter where the incident is described, he adds that he hopes to soon give ‘a proof that Felpham is propitious to the arts’. The journey from London to Felpham took the Blakes some seventeen hours, the discomforts of which were borne cheerfully. They had been in great anticipation of it since Blake’s new patron —a well-meaning and eccentric minor poet, William Hayley—, had proposed to him to move to Felpham and work ‘under his auspices’. ‘My fingers Emit sparks of fire with Expectation of my future labours’, Blake had written to him, for he was full of hope. For the ever diligent, ever struggling, ever neglected genius, the cottage by the sea would be sanctuary. The sheer expanse of a newly discovered wonder —the sea, that he had never seen before— mesmerised him. It was a portent made of water as much as one of light. Shifting light. As he walked along the shore, he saw ‘majestic shadows, grey but luminous, and superior to the common height of men’. They were the subtle embodiment of ancient poets and prophets, and it is indeed in Felpham where Blake began to give shape to what would later be known as his Prophetic Books, as if this new scenery, in which the greatest drama unfolded was one of shifting light, compelled him to go beyond the confines of his own vision. Everything around Blake was a symbol of a vaster reality, and when he made with Catherine the seven-mile long walk into Chichester, he envisaged in that ‘handsome city’ the lineaments of Golgonooza, the hallowed city of creation that would hold such an important place in his work to come. Since Golgonooza’s outward ideal is the projection of an inner place, Blake was in fact already living in it as he sat hearing ‘the sea roaring at a distance’ in his Felpham cottage. Following his correspondence from the years he lived there, it’s plausible to believe that his visionary experience of the workaday world multiplied in the West Sussex village: the wind over a cornfield was ‘the noise of souls . . . borne down by Clouds’, and he had intimations of God’s spirit moving above the waters. He was ‘under the direction of Messengers from Heaven, daily & nightly’, and in some letters he broke into chants that extolled the grace he found: ‘Away to sweet Felpham, for Heaven is there/The Ladder of Angels descends thro’ the air’ . . . ‘The Bread of sweet Thought & the Wine of Delight feeds the Village of Felpham by day & by night’. A poem in a letter to Thomas Butts tells of a mystical experience while sitting on the beach, when light enfolded him, its ‘particles bright’ becoming One Man that encompassed the holiness of all creation. The vastness of the sea, the sky and the fields around him embodied the infinity he longed for. It was also in Felpham that the words were born for what would become not so much an alternative anthem for England as a hymn for a spiritual land for all humanity: Jerusalem. Felpham taught Blake that sacred lands are conquered with bows of burning gold and arrows of desire. In a letter Hayley draws a portrait of Blake and Catherine’s life in the “neat little cottage”: indefatigable, loving, singing — happy. Indeed, in Blake’s depiction of his cottage in Milton, the sense is one of joy, as he’s greeted by an angelic figure, perhaps Ololon: the twelve-year-old Virgin who’s also an emblem of awesome courage contained in a fragile shape, as she’s the transformative agent that brings Milton back into the world so that he can see. Willing to be immersed in the world’s blood and pain in the process, she’s thus a transformative agent for Blake himself, who realises through her the integration of the feminine into humanity’s fragmented state. So was it all happiness and heavenly visions, in Felpham? Was the cottage in Felpham really sanctuary? What is sanctuary; what do we actually need when we long for one? Blake and Catherine moved to Felpham brimming with a longing both spiritual and mundane. They bore the fatigue and hardship that London had imposed upon the artist’s unrecognised genius. Apart from the printing press, graving tools and copper plates, the most precious thing they carried in that prolonged journey from Lambeth to Felpham was a grain of sand. It was meant to multiply on Felpham’s shore. Now Blake had a generous patron that would keep the fiends of want away, the pressure of the cruel competition of true genius against the art establishment in London would lift, and with these alleviation of mundane cares, Blake would be able to devote himself to shape through his own art what he saw and heard in vision. Cruel holiness. Los does not take him there flying smoothly on a chariot pulled by winged horses, but in a fiery whirlwind. Or an exhausting seventeen hour trip through which the exhilaration of the sweet future envisaged, as opposed to the hardship left behind, may have at some points married anxiety, its pangs in the belly. The notion of cruel holiness may help us understand why later Blake would refer to his time in Felpham as his and Catherine’s “three years’ trouble”. The truth of the matter is, in the sanctuary of his Felpham cottage, William Blake did suffer. Worse still, he felt that his creative force suffered too. He had not escaped the fiends he dreaded, those of an uncomprehending world imposing onto his artistic genius. We cannot dwell much here on the complex relationship between William Hayley and Blake, but it is perhaps illustrated by the fact that Hayley was the embodiment of what Blake called a ‘corporeal friend’ and ‘spiritual enemy’. Their friendship must have been a knotted weave of good intentions, generosity, ignorance, unconscious envy on the part of Hayley, and frustration and resentment that could flare even as ingratitude on the part of Blake. Whereas Hayley sought innumerable ways to keep Blake busy under his patronage, and to procure him new sources of income, the fact is that Blake spent a great deal of time illustrating the works of a poet whose talents were blatantly inferior to his, and engaged in futile projects that dulled vision and robbed him of time to articulate through his own art that infinity he longed for. Hayley indeed referred to Blake on occasion as his secretary; he probably meant his best yet it’s very likely that he failed to understand the portentous talent of the artist he had decided to take under his wing. What he assumed was work that would suit Blake’s best interests must have often been insulting. He extolled Blake’s indefatigable industry, but was condescending too. ‘I have an excellent enthusiastic Creature … under my own Eye’, he’d say; ‘my worthy artist who works constantly in my study.’ Poor Hayley! We can pity him now —the nuance of ownership, the conviction of how much Blake was indebted to him, who is now only remembered because of his association with one of the greatest artists the world has seen. Poor good, simple-hearted Hayley, making a fool of himself for history. And yet, when the story was being lived, our sympathy should be with Blake —the emotional and psychological strain of being thus seen and used, as his patron’s personal assistant and pet artist, his merits as a poet entirely overlooked, indeed fettered his own art. The dampness in the cottage made Catherine recurrently ill with a rheumatic affection. Blake got ill too. He felt isolated. Some of Hayley’s acquaintances expressed doubts about his talent, and the ambiguous terms in which Hayley defended him echoed the curse that had besieged him in London and would follow him everywhere: the powers of his Imagination were ‘perilious’, he had ‘admirable faculties’ but also a ‘dangerously acute’ sensibility. In short, what distinguished him from other artists —namely genius— was taken for madness. So there was despair. ‘I should be Employ’d in Greater things’, he said, and he adds that he had been ‘very Unhappy’. So again, was Felpham sanctuary? In 1802, during his stay in Felpham, Blake had a vision. He’s enjoying the sweetness of the countryside, ‘With happiness stretchd across the hills’, when suddenly God himself is made manifest in the company of Silver Angels, Golden Demons and a host of the dead. The natural world is transfigured, inhabited by these spirits that first enrage and frighten him. Then the sun descends onto the earth ‘in fierce flames’ and Blake recognises Los within it. 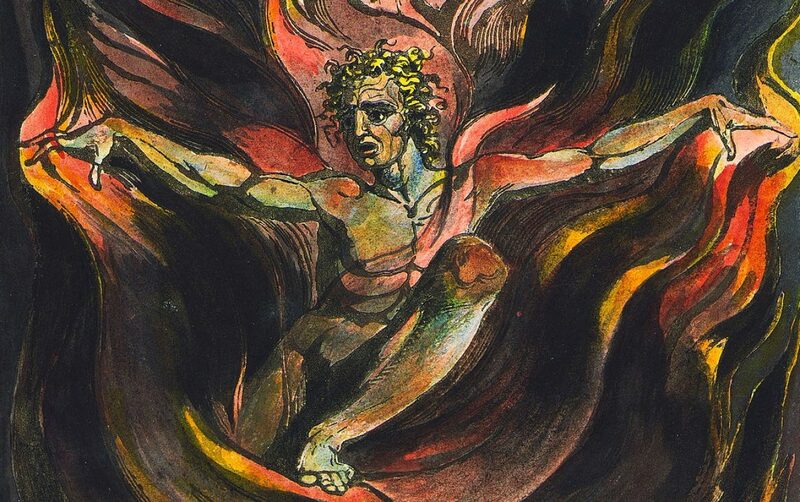 The power of that incarnation of Poetry and Prophecy does terrify him so the first thing Blake does is challenge him —the visions he brings along are not of thyme-perfumed fields: ‘And every Soul of men on the Earth/ Felt affliction & sorrow & sickness & dearth’. Yet Blake walks courageously through his fear, accepts the painful gift that is bestowed to him and vows to honour it with the first glimpses of what would later become the famous hymn, ‘With the bows of my Mind & the Arrows of Thought/ My bowstring fierce with Ardour breathes/ My arrows glow in their golden sheaves’. The freedom this fourfold vision granted stayed with him. Even as he traversed patches of darkness —incomprehension, isolation, illness— he was labouring in Golgonooza. The forge of Los was his own heart and brain that, just as that of his Tyger, was formed in fire. Precisely because he was being ‘imposed upon’, fettered against the hard rock of what people called reality, he gave birth to his prophetic poems. Because he was fettered he created Orc, the fiery boy who would rather rage and burn than accepting the condescending ignorance and, therefore, violence, of those around him. He created the Spectre, who may be inspired in Hayley yet is the embodiment of everything that is rotten through doubt, smallness, envy and pettiness in all of us. Surely Blake, when speaking through the voice of Los harrying him, spoke also to the Spectre within himself —when he did doubt, when he raged futilely rather than creatively, when he gave in to despair. Cornered as he felt to be, he was also enfolded by the air and the sea, the waves rolling at his feet, the lark flying over him. He was never idle —he learnt Greek and Latin, Hebrew, and studied Italian so as to better understand Dante. He also pondered on his own stance as an artist in the past and what his genius demanded of him to go forward, and doing that ‘was consolation enough’. His departure of Felpham was, we could say, traumatic: tried for sedition after having been accused by Scofield, a drunken soldier, one of the many stationed on the West Sussex Coast in guard against a Napoleonic invasion. That’s in itself another story, but it’s emblematic of the degree of drama, fear and despair that William Blake experienced in his sanctuary in Felpham. A glass rummer has been found, purportedly belonging to him, engraved with the outline of a winged creature, then the legend, ‘Blake in Anguish Felpham August 1803′. However authentic the goblet may be, there is no doubt that Blake suffered anguish in that little village. Yet he took with him the murmur of the rolling waves, the lark and heavenly visions hovering over his head, and once back in London, as he composed his epic poems Milton and Jerusalem, Felpham still breathed through him. So it is that in Milton he tells how in his Cottage’s garden the blind poet’s spirit descended at dawn, heralded by Ololon and opening the way for divine revelation, the force of which makes Blake faint, then recover with Catherine, his ‘sweet shadow of delight’, by his side. In that timeless moment of revelation, the poetic genius transcends the separation of individuals, of the self from the world, the dead from the living. What Blake understood as poetic and prophetic vision, the one arrow that pierces the smallness, helplessness, fear and misery of our lives as perceived through ‘our senses five’, was made manifest in Blake’s garden in Felpham and therefore that garden, that Cottage, Felpham as a whole and all of its shore are imbued of real presence, in eternity. Blake’s Cottage in Felpham is the grain of sand, and the moment in each day, that Satan cannot find. In 1803 the Blakes returned to London poorer than when they left. There must have been fear and anguish, when the journey they had started with such hopes three years earlier had led them into disappointment and pain. Blake’s trial for sedition was still pending. From their smaller, humbler, gardenless dwellings in 17 South Molton Street, they were face to face again with the steeled cruelty of London. As so many souls did. As so many souls do. Artists, authors, thinkers with a vision of a world that is rendered habitable, and meaningful, by virtue of beauty and truth; a vision of the freedom brought about by the release of our pent-up energies, so pathetically spent in fighting the wars of a much lesser world that tears itself apart, dulls and degrades itself futilely, mindlessly, for nothing that is of any worth. A vision of Golgonooza. Spirits, minds, individuals in cruel London, Damascus, Bangalore, Sarajevo, Prague, Mexico City, Tiananmen, along the shores of many ports or in small villages lost across all continents; people holding the vision of a hallowed world close to their hearts as they walk down indifferent streets, peer into the dull sterile monotony of screens, learn in their heart and flesh, just as Blake did, that the world hurts. People who know that the human heart needs respite, shelter, a vastness where it can soar. Prophets capable of conceiving such a world, who know of the courage needed to shatter our brittle, sad mundane shell. People who recognise that they struggle too with the pathetic fiends of mundane existence, that they too have their years of slumber, their time of doubt and despair; people who know that the seeds of beauty grow in the dark and in silence, and the fruits have to be reaped amongst the turmoil and violence of an inchoate existence perpetually stretched between contrary forces. People who recognise, in their own experience of pain as they breathe in this world, the need for sanctuary. Somehow William Blake fought that battle in Felpham for all of us, by setting an example of how to fight it fruitfully. As he surrendered himself to Milton’s spirit in his garden, he pierced the darkness and made of his dwellings a visionary home. Now it is his spirit, fused into Milton’s and, ultimately, that of Los, that breathes there for whoever who, paraphrasing Blake in The Everlasting Gospel, can see through the eye, not merely with it. No matter how much (going back to the same quote), This Lifes dim Windows of the Soul/ Distorts the Heavens from Pole to Pole/ And leads you to Believe a lie, and no matter how many outrages are aimed now at Blake’s legacy or the material fabric of the places he lived in (most of them, in fact, have disappeared from the face of the earth), there is no affront that can touch that force, that truth. Because he had the courage to feel his own pain as he lay fettered, to peer into the darkness with Los as a sun in his hand, because he believed in his fourfold vision and used his energy to give it shape in concrete creations of truth and beauty, William Blake opened the gate, and made of his work and his exemplary life a sanctuary for us all.